CHV Board, members, volunteers and staff design a strategic plan to guide the organization's growth, staffing priorities, and budgeting to realize its mission. in 2019, we are undertaking a stratetic planning process for 2019-23. Below are a few planning documents to see where CHV has gone in the past five years. A logic model is a visual representation that shows what an organization does and why. It explains why a strategy is a good solution to the challenge at hand. The model below offers a visual statement of the activities that bring about change and the results we expect to see. Logic models are useful for new and existing programs. Ensuring sustainability demands proving the effectiveness of what CHV achieves: keeping seniors healthy, engaged, and safe. While this is a sensible and desirable goal for our own self-interests, it is also of great importance to the health care industry, which seeks cost-cutting options throughout the health care system. CHV believes that demonstrating the Village model’s effectiveness will lead to increased investment from the public and private sectors, which are already documenting the health care savings when older adults live at home. To demonstrate that CHV is a regional and national model and by collaborating with other Villages and organizations, CHV is making an investment in the organization’s sustainability. There are other important aspects of sustainability: 1) keeping the need for intensive services at bay for as long as possible, (i.e., keeping seniors healthy and safe) and 2) increasing community-wide awareness and elevating conversations about aging in community and the role CHV can play. 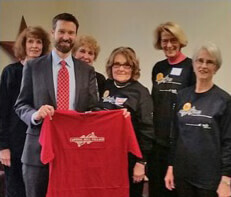 To these ends CHV is increasing the number and diversity of wellness and educational programs for members and led the larger Capitol Hill community to speak on behalf of seniors for improvements in health, transportation, and housing resources that increase livability and longevity. There are two other important aspects of sustainability: 1) keeping the need for intensive services at bay for as long as possible, i.e., keeping seniors healthy and safe) and 2) increasing community-wide awareness and elevating conversations about aging in community and the role CHV can play. 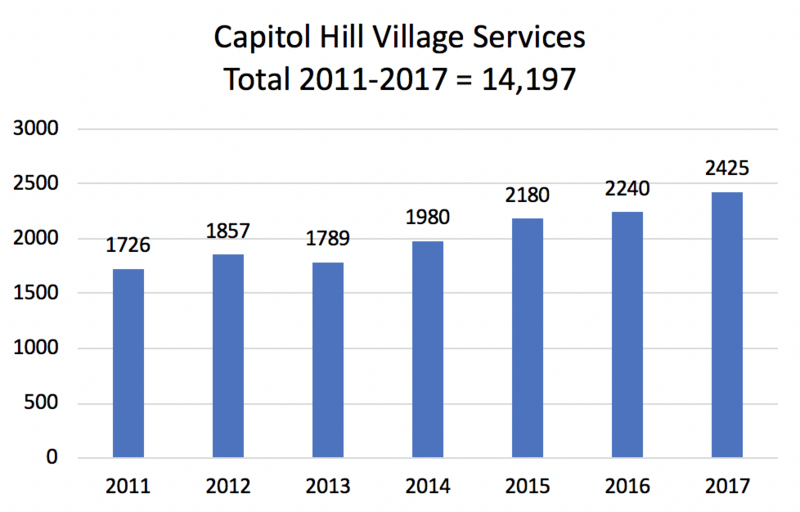 To these ends CHV has increased the number and diversity of wellness and educational programs for members and led the larger Capitol Hill community to speak on behalf of seniors for improvements in health, transportation, and housing resources that increase livability and longevity. We believe the strategy is working. The proportion of individuals participating in Care Services has not changed, even as CHV has gained more members and even though the average age of membership is increasing. Why Can’t CHV Survive on Member Dues? CHV has never been sustainable on dues alone. It has been subsidized with donations and in-kind support: donated office space, graphic design, a member-designed IT system. As the organization grew and depended more on professionals, expenses increased, including IT, bookkeeping, office space (and associated infrastructure costs), and staff salaries. If CHV were to survive only from member dues, services would be drastically reduced and member dues would increase. CHV cannot and should not be the only answer to aging independently in community. Capitol Hill as a community and society in general need to implement other resources, services, and amenities for seniors—in much the same way that we do for children. Since CHV is a strong network of smart, committed citizens, it is the right group to be identifying best practices, leveraging partnerships, and advocating for the needs of seniors. These include accessible housing; improved transportation options; better wellness and recreation resources; a range of health centers, including rehabilitation, daytime adult care center, dementia care, hospice and more. For these reasons CHV hosts educational events, advocacy groups and is in continual conversation with a range of partners to elevate the conversation about longevity and its impact on individuals, communities, and society and how we can collectively address it. 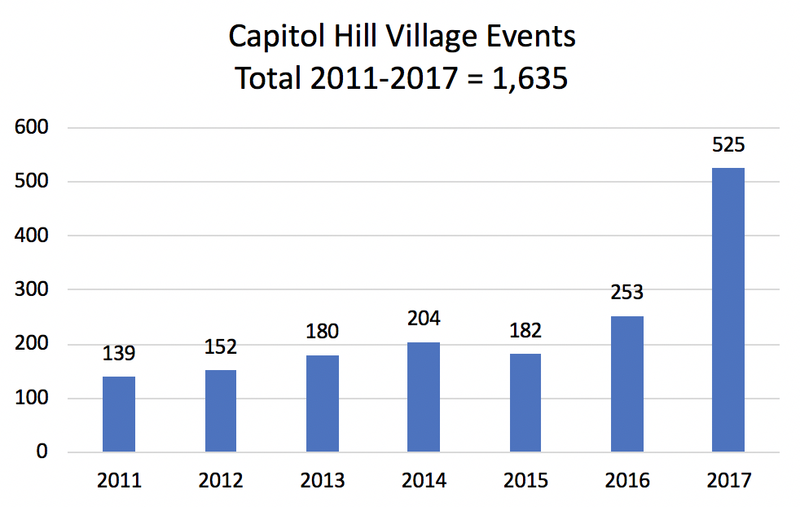 This section looks at Capitol Hill Village’s growth. The Village has grown in number of members while the average age of members has increased. The increased member numbers seem to correlate with the increased number of activities in the year. In so much as CHV is dedicated to keeping individuals healthy, safe, and connected, the fact that service needs have NOT grown as rapidly as the ages of members and numbers of members is a good outcome. However, although the number of individuals who are a part of Care Services has not increased proportionately, the intensity of services has increased.